I am a senior solicitor in the child brain injury team at Bolt Burdon Kemp. I act for children who have sustained a brain injury as a result of negligence. I recently saw a video piece on the BBC news website which left me feeling completely inspired. It was about an aspiring barrister called Daniel who has a law degree from Queen Mary University and a master’s degree in Human Rights Law. 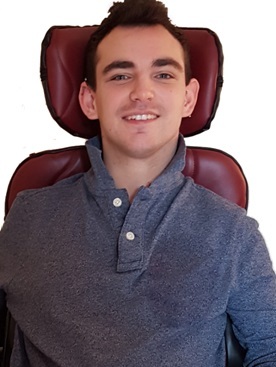 Daniel also happens to have cerebral palsy but is determined not to let the barriers in society stop him from achieving his dream of becoming a barrister. Daniel will be starting his barrister’s course in September after securing a scholarship from Middle Temple, which is a fantastic achievement. The link to Daniel’s feature on the BBC news website can be found here. This blog will focus on the challenges to learning faced by some children who have cerebral palsy, and the services available to support them. Daniel’s story is an amazing example of what can be achieved, if a hard working and dedicated student is offered the right support. I met with Daniel to discuss his past education and his ambitions for the future and I found his attitude and zest for life is infectious. Daniel went to a special needs school where there was a big focus was on overall wellbeing. He says that the nurturing and supportive environment and being around other disabled people allowed him to develop confidence and a strong personality. He was never bullied at school since everyone had different impairments and being disabled was the norm. Daniel noted that his mainstream counterparts are not always so lucky. He argues that the inclusion of disabled children at mainstream schools will only work when they are willing to put in place all the necessary support and anti-bullying measures. Daniel has wanted to be barrister since the age of 14 after being inspired by what he saw on TV and his desire to change the world around him. He now sees the role as a chance to introduce positive change within the confines of the law. He wants to help others achieve just outcomes with all parties being helped to formulate coherent and persuasive arguments. He finds being able to control his own practice and progression attractive too. Daniel left Manchester to read law at Queen Mary University of London, with the dream of being at a top three law school and working in the UK’s biggest legal market. He became the first member of his family to go to university. Daniel excelled in his legal studies although he explained that being disabled and studying law was very challenging. He had to work twice as hard as his peers did because things take him longer. He also took on the mantle of Disabled Students’ Representative and held all roles with the Ability Society throughout his studies. When asked about what advice he would offer to his peers, Daniel replied “don’t give up on whatever you believe in, keep at it and you will learn and adapt.” Daniel had a glint in his eye as he confidently told me that we should all do things outside our comfort zone and he is a wonderful example of this. So what is cerebral palsy? Cerebral palsy is a condition which affects muscle control, movement and co-ordination. It is often caused by an injury to the brain that occurs before, during or soon after birth. Each individual can be affected in a different way but cerebral palsy will commonly affect a person’s movements, posture and balance. People with cerebral palsy may also have difficulties with swallowing, breathing, head and neck control, bladder and bowel control, eating and digestion. How does cerebral palsy affect learning? The above can impact on literacy, numeracy and classroom skills and activities. Children with cerebral palsy often also have to put more effort into concentrating on their movements and sequence of actions and can therefore often tire more easily. An education, health and care plan (EHCP) can be offered to children and young people up to the age of 25 years old. The EHCP will identify the specific individual’s needs and the additional support that is required to meet those needs. If a child is granted an EHCP then it may also be possible to obtain a personal budget for the child. This allows parents to have a say in how the money is spent. If the problem can’t be resolved directly with the local authority then it is possible to appeal to the Special Educational Needs and Disabilities Tribunal. Within our team, we have experience in successfully appealing local authority decisions at the tribunal previously. This is a service offered to all of our child clients who have suffered a brain injury. Local authorities have various legal duties to identify and assess the special educational needs of the children and young people for whom they are responsible. This duty is activated as soon as the local authority becomes aware that a child or young person may have special educational needs. There are laws that require the local authority to always consider how a child or young person can be supported to facilitate their development and to help them achieve the “best possible educational and other outcomes”. If an EHCP is produced and specifies special educational provision, the local authority has a legal duty to provide it. This cannot be overruled by the local authority’s special educational needs policy or other internal arrangements. The current provision for children with special educational needs is far from perfect but there is support available to ensure each and every child achieves their potential in education. Mala Patel is a solicitor in the Child Brain Injury team at Bolt Burdon Kemp. If you or a loved one is concerned about the treatment you have received, contact Mala free of charge and in confidence on 020 7288 4822 or at MalaPatel@boltburdonkemp.co.uk. Alternatively, complete this form and one of the solicitors in the Child Brain Injury team will contact you. Find out more about the Child Brain Injury team.